JUPITER, FL – It didn’t have to be said, but every Atlanta Bulls player knew — this one was for Jim. 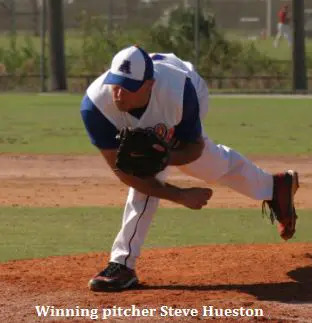 Playing with a heavy heart following the tragic death of assistant coach Jim Sims, Jr. just 11 days prior, the Braves rode Steve Hueston’s dominant two-hit pitching performance to a championship game victory. Atlanta manager Jeff Boyar, who knew Sims, Jr. for more than 20 years, was heartbroken at the loss of his friend. “He had the biggest smile on the team and he was the most positive person I’ve ever met. He had friends all over the country. Once you shook his hand, he would shake your hand and you knew Jim Sims.”Bulls’ players wore wristbands and hung Sims Jr.’s jersey in the dugout throughout the game after the 66-year-old Stockbridge, Ga. resident was killed in the early morning hours of Nov. 6 in what turned into a three vehicle accident on Interstate 75 near Parrish, Fl. The accident was originally caused by an 18-year-old driver who lost control of her car after dropping her cell phone. Sim’s vehicle hit her car, which had rolled over and come to rest on the highway. Sim’s Chevy Suburban was then struck by a tractor trailer moments later, police said. While Sims, Jr. was on the minds of each Bulls player, Hueston was the story of the game. Normally reserved to a set-up role, Huston eagerly lobbied for the starting assignment. With his defense playing error free and grabbing nearly every ball hit in play, Hueston cruised. He needed just 96 pitches to go the distance, walking one and allowing just five base runners –only one reaching second. Meanwhile, Atlanta, which lost in the final a year ago, scored single runs in the first, second and third to grab an early lead and give Hueston all the support he’d need. Hueston explained that his game plan was originally to mix his pitches well, keeping the Venezuela hitters off balance, but when he realized they had difficulty hitting his fastball, he continued to pound the strike zone with hard stuff. “I really didn’t have to use my other pitches,” he said. For Boyar, Hueston’s superb effort was just another in a long list turned in by Bulls’ pitchers all week, including Lee Rodney’s three-hit shutout of the Southern Riptides in a 2-0 semifinal victory, one game after Atlanta defeated the Connecticut Top Hats, 14-5. “We were blessed to have quite a pitching staff,” the manager said. Having former major league catcher Glenn Sutko behind the plate did not hurt the pitching staff, Boyar said. “They aren’t tools of ignorance,” Boyar added. Venezuela meanwhile won a pair of one-run games to face Atlanta, besting the East Coast Cardinals, 1-0 and Great Lakes Red Sox, 3-2 behind Edinson Urbina’s four hitter and Joel Albaran’s stellar mound effort. In the end, with the championship trophy residing where it was meant to for at least one year, Boyar reflected on what had just transpired.